Cheryl Brodersen, ministry leader and popular speaker, knows it's time for women to understand the daily battle they're facing-to pinpoint their enemies, claim their God-given weapons, and examine the true prize awaiting them. God wants His daughters to live moment by moment in His victory, but first they have to see what's at stake when they go their own way. The truth about grace is simpler-and deeper-than you may realize. Discover how this life-saving, life-sustaining resource can be your motivation and means for living in freedom today. 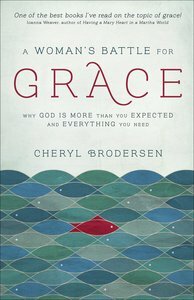 About "A Woman's Battle For Grace: Why God is More Than You Expected and Everything You Need"
Cheryl Brodersen, the daughter of Pastor Chuck and Kay Smith, is an author and conference/retreat speaker. She teaches the popular Friday Women's Bible study, hosts Today's Faith on hischannel.com, cohosts the radio call-in show Pastor's Perspective, and is a proud mother and grandmother. She and her husband, Pastor Brian Brodersen, currently serve at Calvary Chapel Costa Mesa.